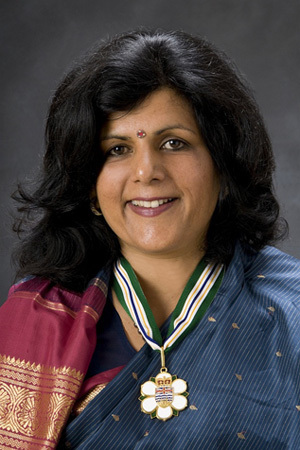 Over the course of her career as a radio and television journalist, Mohini Singh became widely known in the Okanagan from Osoyoos to Shuswap, and beyond. Ms. Singh has consistently looked for opportunities to make a positive difference in the lives of the people of her region. Her journalistic work has consistently been to a high standard, showing integrity, dedication and a motivation to make the lives of people in her home region and elsewhere safer, more just and better. As a community activist, Ms. Singh has participated in a wide range of activities, many involving helping those who are disadvantaged or building bridges within and between communities. She has advocated for women and children who have experienced violence. She has promoted cultural tolerance and understanding. She has worked on issues as diverse as avalanche safety, spousal abuse, literacy, and the plight of orphans in India. Even as her own struggle with multiple sclerosis became more challenging, Ms. Singh adopted a young child from India and dedicated her efforts as an artist in clay to local charities and foundations. Through these community endeavours and many others, Ms. Singh has a long-standing history of leadership in volunteer service, professional excellence, arts and culture, and social tolerance and inclusion.